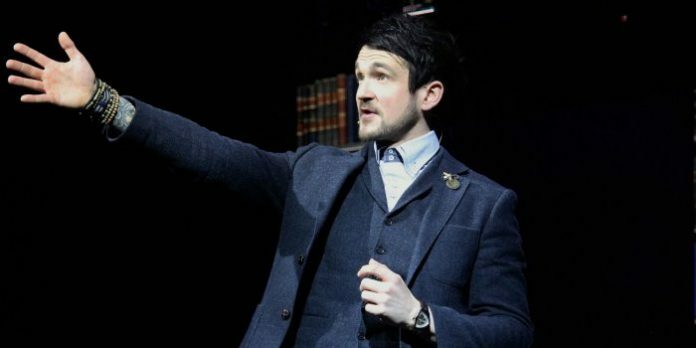 Colin Cloud stars alongside Jonathan Goodwin, An Ha Lim, Darcy Oake, and Adam Trent in The Illusionsists. Better known for presenting touring productions of large-scale musicals, Broadway Across Canada takes a different approach with The Illusionists, currently on stage at Vancouver’s Queen Elizabeth Theatre. But while the magic illusions may at times astound, it is packaged in a surprisingly lackluster production, more akin to what might appear in one of Las Vegas’ older properties. In featuring five different performers with different specialties though, what the The Illusionists lacks in pizzazz at least makes up for in variety. The biggest surprise, beyond some of the illusions, comes in how little the five interact with each other. Given solo opportunities to shine in this 2+ hour show, there is a lost opportunity for the quintet to come together for one giant illusion at the end. Instead, the show just fizzles out. It might have also helped in creating some cohesion between the individual performances, which comes across more as a magic variety show. With a bold subtitle announcing it “Live From Broadway”, The Illusionists gives us few of the promised (and expected) Broadway-worthy moments. And while each of the five illusionists brings something different to the proceedings, some fare better than others. We’re told there are no tricks involved in what Goodwin does, but even if you take that statement with a grain of salt, there is no denying he is fearless. Having one of the night’s best stage presences, he is as likeable as he is wacky. Winnipeg’s own represents with many of the bigger scale illusions. As the quintessential Canadian, Oake is quietly understated even when he goes big, and his simple nod to the audience’s approval at the end of each of his illusions is simply adorable. Boldly announcing him as “one of the most televised magicians working” in the program, is it any wonder why Trent plays so fully to the live cameras which follow the quintet through their segments. Trent does try to mix things up a bit from the more traditional illusions with the use of technology, but most of it is in simple timing, and the one big trick where he jumps between large video screens in a blink-of-the-eye only registers well after the show moves on. Lim’s skills with manipulating cards are indeed impressive but his stage presence seemed very wooden. Not saying a word, he pulls deck-after-deck from the hidden folds of his suit. He is also the show’s encore, and while again impressive in his card manipulation it is rather anti-climactic in a show that already lacks a proper ending. The Illusionists. Directed by Neil Dorwood. A Simon Painter, Tim Lawson, and MagicSpace Entertainment production. Presented by Broadway Across Canada. On stage at the Queen Elizabeth Theatre (600 Hamilton St, Vancouver) until January 20. Visit vancouver.broadway.com for tickets and information.